Cloisonne beads are enameled metal, and produce a picture or mosaic similar to a stained glass window. These beads come in many colors and shapes. 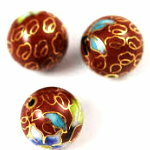 Special "gold", "silver" and "imperial" beads are a little more intricately made, as are "twisted wire" cloisonne beads. There are also cloisonne "wiggle" pendants, like fish, turtles which are found in our CHARMS section. When a product is labeled "LEAD FREE", it means that it complies with current state, federal and/or international laws regarding how much lead is permissible to leach out from a product. The label does not mean that the product has no lead content. This applies to pewter. It applies to other metals. It applies to glass crystal. 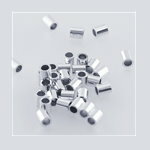 Round seamless, Round Benchmade, Rondelles, Corrugated, Ovals, Other Plain Shapes and Fancy Designs, Narrow and Curved Tubes, Tubes with Loops, Liquid Silver, English, Greek and Hebrew Letter Beads (cubes, symbols, words), Stone-Set Beads, Twister Beads, Double Beads, Birthstone Beads, Quads. Cubes (4.5mm, 5.5mm) in English letters, numbers, symbols, Greek letters, Hebrew Letters. Raw metal beads get their color, their shine and their texture from the metal material itself. Often, it takes a soft cotton cloth to polish up the metal and thus achieve its ultimate finish and look. 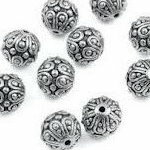 When using plated beads, it is important to know what the metal is that is underneath the plating. Plating adheres well to brass, copper and pewter. It adheres OK to nickel. It does not adhere well to base metal, steel or aluminum. Plating has two separate chemicals, one which gives the plating its color, and the other which gives the chemical its brightness. The "brightness" chemical wears off much more quickly than the "color" itself. 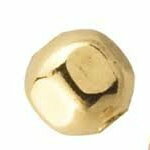 A gold-plated brass bead will first lose its brightness, then the color will slowly fade. Because brass is golden, when the plating wears off, the bead will still look golden. A gold-plated aluminum bead will first lose its brightness, then the color will fade, but long before the color fades, the plating will probably have chipped off. Since aluminum is silver, when the gold chips off or fades, the bead will look silver. ARGENTIUM SILVER: is 92.5% silver. Alloy is different than for sterling silver. 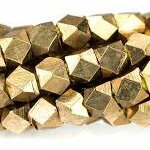 BRASS: Brass beads are an inexpensive substitute for gold. Brass can be raw or plated. Brass itself will vary in color from a dark copperish gold to a bright yellow gold, depending on its chemical makeup. [Brass can even be white, but our beads labeled "raw brass" are not.] Brass, like sterling silver, tarnishes -- especially in great humidity or great air pollution. Just use a soft cotton cloth to polish it to its original shine. Plating adheres very well to brass, and will slowly dull and then fade away. How fast this occurs depends on the wearer's body chemistry, and the quality and humidity of the air. It can wear off in a few months or a year. In ethnic jewelry or victorian, antique-looking jewelry, you may want to use brightly plated beads, but hesitate because these beads are so shiny. No problem. 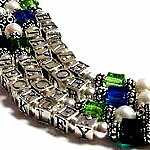 To dull any plated finish, just spray the beads with windex or any other glass cleaner with ammonia. The ammonia dissolves the chemical that causes the "brightness". 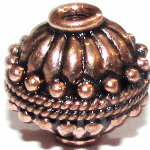 COPPER: Copper gives an ethnic or antique look to jewelry. Copper will tarnish. Use a soft cloth to polish it to its original shine. If you let copper oxidize with age, it will eventually develop a greenish patina. 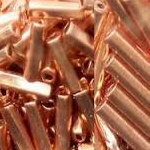 Plating adheres very well to copper. NICKEL: This is an inexpensive substitute for silver, but it has a duller shine to it. It turns black over time, and will polish up with a soft cloth. Sometimes this material is called Nickel-Silver. Nickel-Silver typically has no silver in it at all. It is usually an alloy of something like 65% copper, 18% nickel and 17% zinc. Nickel-Silver goes by many names including Alpaca and Raj Silver. This is less expensive than sterling silver, and tarnishes faster than sterling silver does. It can, however, be polished to a bright silver shine with a soft cloth. Plating adheres OK to nickel, but where the plating does not bond, the nickel will continue to tarnish under the plating, making the plating look blotchy on the surface. 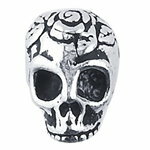 PEWTER: This dullish silver metal alloy is very popular today. It gives a medieval or antique appearance to things. It's weight gives a piece a certain "substance". Lead free pewter can give the appearance of sterling silver from a distance, though the touch and weight of each pewter piece is quite different were it compared to a similar sterling silver piece. Leaded pewter will get darker with age, and is difficult to buff up to its original shine and color. Pewter is a soft material, and thus very malleable into many shapes and designs. It is very popular among the college age crowd as a less expensive substitute for sterling silver. Pewter may be used in its raw form, or plated. Sometimes the plating is given a further oxidized treatment to darken and antique the coloration. There are different qualities of pewter, usually dependent on how much lead is used in its formula. The more lead, the lower the quality. The more lead, the more the pewter darkens and tarnishes with age. It takes a lot of polishing to get that tarnish off. 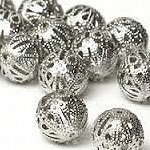 It was my long-held understanding that, in the US since the mid 1980s, only lead-free pewter beads were supposedly allowed on the market. The pewter products we carry are, in fact, lead free. But in light of consumer product safety reports 2005-2009, it seems a lot of pewter products, manufactured overseas, may contain some lead. STERLING SILVER is 92.5% silver, and is often stamped .925. FINE SILVER is 99.9% silver, and is stamped .999. VERMEIL: This is gold-plating over sterling silver. The plating adheres OK to silver, but not perfectly. Where it has not bonded to the silver, the silver will continue to tarnish under the plating, making the plating blotchy. Vermeil darkens with age, as the silver underneath it tarnishes. 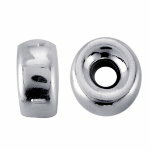 These base metal and brass beads have a plated finish, such as gold-plate, silver-plate, palladium-plate, silver-matte, and the like. These finishes will wear off over time, either when repeatedly worn, or when exposed to high levels of air pollution often found in city environments. 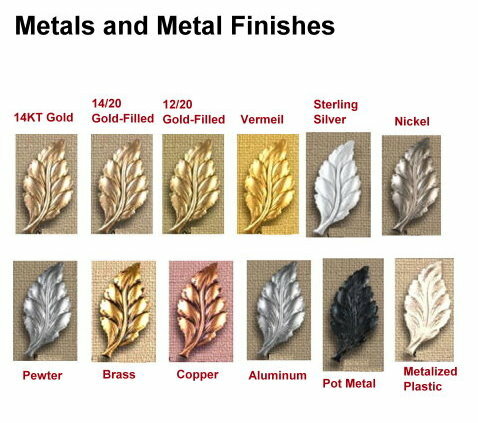 Another type of metal finish is a chemical oxidation effect. Here the metal is dipped in a chemical that will react with the metal's chemical composition, and create a color change. Often, this means darkening or blackening the piece. Othertimes, different colored patinas can be created, from a green-verite to a gold to a purple to a rainbow effect. These effects often wear off when exposed to detergents, such as soapy water and dishwashing detergent. Yet another metal finish is the application of a varnish or lacquer stain. This technique is used most often to give a piece an antique look. It darkens the piece, and adds a aged-shine or patina. This technique usually leaves a durable finish which doesn't wear off or fade over time, but could be chipped off. If the technique is not applied correctly, the finish might peel off over time. - How Many Beads On A Strand?